With the popularity of crossovers rising, customers can now choose from compact, midsize, and full-size. The options are endless and it can make deciding on a crossover difficult and stressful. Compact crossovers are great for individuals and families as they offer adequate interior space but with the fuel economy and handling of a sedan. Take a look at our 2017 Mazda CX-3 vs 2017 Subaru Crosstrek comparison to see what compact crossover model may be the one for you. The 2017 Mazda CX-3 is the smallest available crossover in the Mazda lineup and it is available in Sport, Touring and Grand Touring models. The 2017 CX-3 is powered by a 2.0-liter four-cylinder engine rated at 146 horsepower and is paired with a six-speed automatic transmission. The 2017 Subaru Crosstrek is powered by the same engine though it is paired with a five-speed manual transmission. The CX-3 also advances above the Crosstrek in fuel economy, beating its city mpg by 6 more miles per gallon. In addition to the CX-3's great fuel economy and performance specs, the compact crossover is known for being packed full of safety and technology features. The base Sport model proves to be an affordable option for customers with the number of standard features including automatic headlights, push-button start, Bluetooth, a rearview camera, a six-speaker audio system, a 7-inch touchscreen and more. The interior of the CX-3 gives off a contemporary design that is as user-friendly as it is comfortable. While the Crosstrek offers more maximum cargo space, the CX-3 still provides enough cargo space to get the job done without taking away comfort and available space from rear passengers. 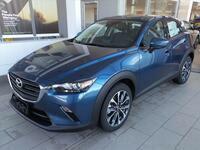 The 2017 Mazda CX-3 is available now at Hall Mazda, part of the Hall Cars automotive group in the Brookfield area. Contact them today to schedule a test drive for the 2017 Mazda CX-3 in the Milwaukee, Brookfield and Waukesha area.